Brian Pelloni currently serves as Of Counsel to Hornstine Law, LLC, and is a founding member and Managing Attorney of Hornstine & Pelloni, LLC. He was previously a founding member of Hornstine, Pelloni & Hornstine, LLC before moving on to other business ventures. While with the firm in a full-time position, Brian successfully handled hundreds of cases ranging from municipal court charges to first degree indictable offenses. Prior to that time, Brian served as a judicial law clerk in the Superior Court of New Jersey, Camden Vicinage, where he worked with judges in both the Criminal and Civil Divisions. Prior to graduating from Villanova University School of Law, Brian also interned for the Philadelphia District Attorney’s Office, where he prosecuted juveniles and adults for crimes ranging from summary offenses to first degree felonies. While in law school at Villanova, Brian took every opportunity to improve and polish his oral trial advocacy skills. He won, and was also honored by the Judges as “best oralist,” in Villanova’s Theodore L. Reimel advocacy competition, which included over 150 competitors. Additionally, while serving as the President of Villanova Law’s Pro Bono Society, Brian helped the local community by creating programs to advise them of their legal rights. In recognition of his efforts, Brian was awarded the Faculty Service Award and Dorothy Day Award for pro bono service. Before law school, Brian graduated from the University of Pennsylvania, where he earned a Bachelor of Applied Science degree in Systems Engineering and a Bachelor of Arts degree in Environmental Science (with distinction). While at Penn, he also earned a Minor in Organizations and Environmental Management through classes at the Wharton School of Business. 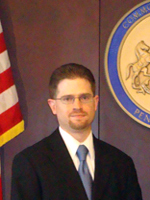 Brian is admitted to practice law in the federal courts and state courts of both Pennsylvania and New Jersey.